Hunger must end before learning begins. One in four children in Oklahoma has inconsistent access to healthy food. Through September 30, the Masonic Fraternity of Oklahoma, Lezlie and David Hudiburg, David Gorham and an anonymous donor, gifts will be matched—up to $150,000. As classes resume, our focus turns to Oklahoma students who need help filling their bellies. Even short periods of time without enough to eat can have long-term damaging effects on a child’s development. By joining our Food for Kids Match Campaign, you’re preparing girls and boys for success — at school and beyond. 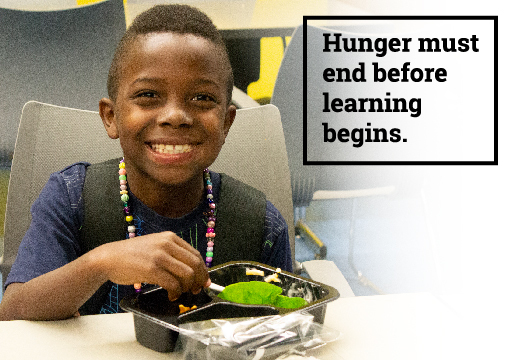 Because of this match, a $100 donation will feed two chronically hungry children through a Food for Kids Program for an entire school year. Thank you so much for helping fight childhood hunger in Oklahoma!